Then look no further as Flip Out in London E6 Trampoline and Adventure Park has it all. There is three floors in total with an amazing array of different trampolines, stunt boxes & trick park, a dodge ball court, 12 warrior climbing walls, London’s first 100 meter indoor caving and potholing experience, an awesome laser maze, a Ninja Warrior course, two massive cyber tower courses, battle beams, foam pit, an adrenaline pumping 30ft drop super slide, East Ham’s largest soft play arena, three cafes including a SCI-FI themed diner, a New York hot dog stand, 7 funky styled birthday and corporate party rooms, enormous cinema seating viewing area and lots, lots more! To read more information or to book a time slot click here. 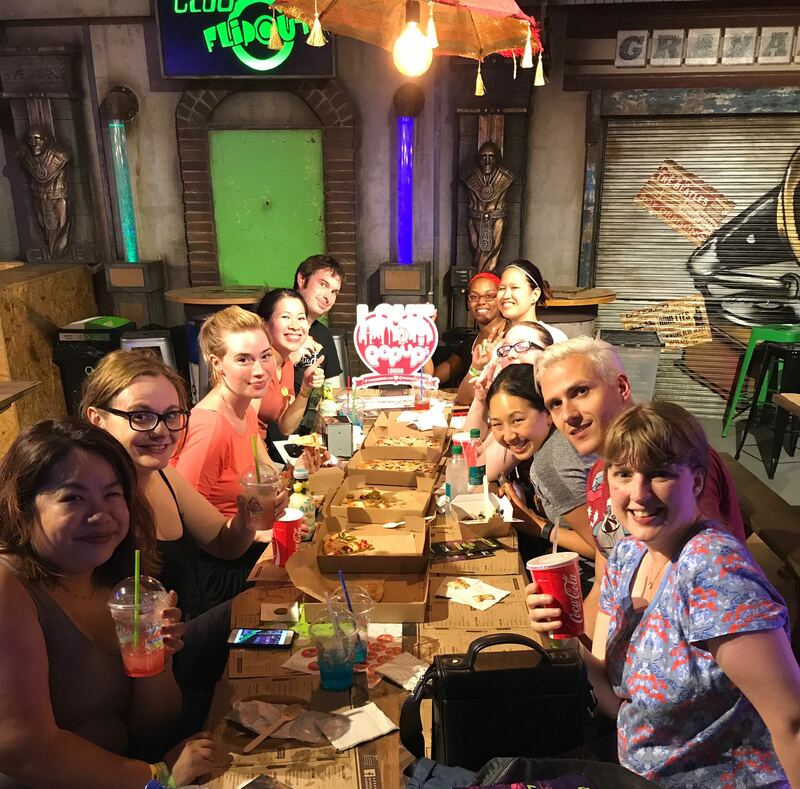 Thanks to Flip Out who let some of the community of Love Pop Ups London come down and jump on the many trampolines and activities available and munching on the amazing food they sell from pizza to salads. Read all communities blogs/review from the comments section below. Great fun! If you are looking for something different, lots of action and parts which run on adrenaline rush then this is the place for you. It is for people of all ages and families too! Don’t need to be the fittest – there is something for everyone which ranges from a Ninja Slide which has two height levels so depends how brave you feel (managed to crack my fear of heights by doing it – felt immense achievement!!!). Laser maze which is not so easy but great fun and has three levels Easy, Medium and Hard (I tried medium). There are plenty of trampolines, pits and a climbing cave. All of which are fun in their own way. There is a jousting area and a climbing tower where two people can compete against each other to see who the best. The staff were very friendly and helpful! One even gave positive encouragement to do the ninja slide – thank you!! The food is also great and reasonably priced. Also as a bonus you get to keep some cool green flip out socks. Oh how can I describe this other than you must must visit this place whether you’re a Londoner or a visitor to this great city!! Firstly the price. Like how seriously cheap is that for London and with that you get so so so much for it including trampoloning from small to large to long laned ones to throw basketballs into hoops to a massively crazy crazy slide that’s like dropping off the edge of a cliff to manovering around a claustrophobic tripping damp cave to acrobatic gymnastic style swings and balancing beam see saws. The list just goes on and on! All thst for a small price! That’s a massive bargain! If you are ever thinking of going to somewhere different go here! Hands down! Best place!! You’ll have whales of fun!!! If you have any hesitation scrap it because this place is way better than bowling or cinema which is around the same price but not as fun!! It’s the indoor theme park of the London world!!! Thanks to LovePopUpsLondon and FilpOutE6, I was one of the lucky few who got to go and experience the newly opened indoor trampoline and adventure park. It’s located in an old Bingo Hall 10 minutes walk from East Ham tube (zone 3). To summarize, this is an amazing indoor area. Perfect for a first or second date or if you have young children. You may have to wait your turn in a couple of activities but there are so many to entertain you, you won’t be disappointed. Flip, dip, cave: a bumping therapy! Once again thanks to @lovepopupslondon I had the opportunity to try something I’ve never done before by exploring the activities at the newly open E6 branch of FlipOut. I was really impressed by this place, plus there is entertainment for kids and adults which is great if you have to organise something for a various group! There are vdifferent types of ticket option but basically if you would like to try a bit of everything it ll cost you 20£ ( sooo worth it) and a major plus is that the staff is genuily happy to work there which makes the experience even more wonderfull a 5 star treat! Til next time for sure!!! Flipout is flipping awesome (see what I did there?)! Their newest location, London E6, is spread over 3 floors of an old East Ham bingo hall. From the outside you definitely wouldn’t guess what was going on inside because let me tell you it is 3 floors of pure madness! On entering the cool graffiti and neon green décor instantly excites but once you get through to the activity zones your inner child will weep. There is so much to do, from trampolining, a lazer maze, climbing wall, dodgeball court and the terrifying 30ft drop slide. As you can tell this isn’t a kids only place with packages available for all ages, making it ideal for team outings, kids parties, stag do’s and birthday parties from 5 to 50! Not only do the activities make it worth a visit, the staff are friendly and enthusiastic, the facilities are clean and the diner serves tasty food at good value! This place literally has everything you need for hours of entertainment – PLUS it is indoors so the English “summer” can’t ruin the fun! I think flip out is a great activity if you’re looking for something different to do with your friends or if you’ve been stuck with your sisters kids (or your own) for the weekend and need something to do that is fun for all of you. There are different parts and zones so you can pick and choose what you feel comfortable doing. I am a very careful person and very accident prone so I usually stay away from things I think look scary. For me personally, flip out was some like a fear factor place where you can choose to face your fears. I chose to just jump around on the trampolines, since I am a little scaredy cat, but flip out also offers cravling around in a cave, climbing walls and going down a 45° slide. Regardless of how brave you are, trampolines are a lot of fun! It is also a great activity if you want to be active but not feeling the gym 🙂 all in all – recommended! What do you get when you take an old bingo hall, pack it full of trampolines, climbing walls, foam pits, laser rooms, caves, good food and one hell of a tall slide? Pure exhilaration! This is the newest location for Flip Out, and it doesn’t get better than this. For the cost of a cinema ticket you will be having the time of your life in a playground made for all ages. Upon entering, the first thing you’ll want to do is get on a trampoline and jump. Well that’s what I did! It was so fun and exhilarating; I have actually never been on one before but felt safe to jump as high as I wanted. Giant trampolines?! Yes please! To be honest I didn’t even read what else FlipOut had going for it after I saw that – I was sold! Thanks to @lovelondonpopups I had the opportunity to check out FlipOut with a bunch of people one evening. Located out East near Bromley-On-Bow (about 10 min walk), FlipOut is unobtrusively located in an old hall. It’s not obvious that it’s an activity centre when you pass but there’s enough signage to know you’re in the right place. Inside there’s a plethora of activities that you can do. Apart from the trampolines there is a small obstacle course (named after the Ninja Warrior tv show, to give you an idea), a laser maze, a giant foam pit, cave crawl, abseiling wall and a giant drop slide! I spent most of my time bouncing away happily with a friend – the trampolines are all floor height and separated into individual ones about 2x1m. A few are also placed next to tall blocks allowing the more adventurous to try some tricks. After much deliberation, I worked up the courage to do the giant slide. It’s a bit intimidating with the drop literally a vertical drop but fun once I finally made the jump! I didn’t have time to try anything else but the others had fun in the maze and on the obstacle course. The cave crawl looked too claustrophobic for me but others might enjoy. So trust me, there’s plenty to fill up a 2 hour session and I think you could easily want to spend longer in there! After we burned up all that energy, food fuel was a necessity and so we grabbed some pizzas and salads. There were also burgers, wraps, chips and cake as options. Look, they weren’t the best I’ve tried but for the type of place it was, I was pretty impressed! The Greek salad in particular was good with lots of feta. Would I go back? Absolutely. It was heaps of fun and I do love the trampolines. Although it may seem like a place for kids, I can assure you that adults can definitely enjoy too!